Fashionable design with a zipper-pull front. Fabric has a slight stretch for a comfortable, snug fit. Provides discreet cooling coverage. Packs are strategically placed for maximum cooling. Provide constant cooling for up to 3 hours. Lightweight vest weighs just 3.0 lbs.! Weight may be adjusted by varying the number of cooling packs used. 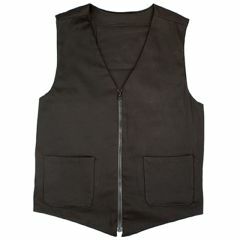 AllegroMedical.com presents The Kool Max Cooling Men's Fashion Vest. This is a great looking vest with no outside logos, adjustment straps or hook-and-loop fastener(s), just a clean, fashionable design. A cooling vest must fit comfortably and snug to the body to be effective. Polar accomplishes this with six vest sizes and by using a deluxe cotton/spandex fabric with a touch of stretch. Polar Products is the only manufacturer offering every major type of personal cooling technology and our product line is always growing! You can feel confident knowing we offer the best value and most effective products for your specific application and climate. Frozen water-based Kool Max Cooling Packs fit into insulated pockets in vests and accessories. Lightweight and efficient packs cool the body in any environment. The cooling vest men have been waiting for... Our proven and best-selling Kool Max® cooling packs in a lightweight and fashionable cooling vest. Our patent pending spinal cooling design enables you to use fewer packs and still receive effective cooling. Additionally, this vest uses separate smaller cooling packs that allow the number and location of packs to be easily adjusted to fit each individual's needs. This also enables each vest to have the appropriate number of packs in proportion to the wearer's size. Lowest Price. Good Selection. Perfect product. Great quality. Good for cooling. Used for overheating symptoms of MS. Looks good, like a regular vest. In reference to the cooling vest, will the cool packs that go into the vest be allowed thru airport security?